The Relief-Care™ Pro Mattress System uses advanced Surface Cut Technology (SCT™) to create a clinically effective support surface. SCT™ enables Blue Chip to produce a therapeutic dual-zone PPF™ Pressurized Polymer Foam support surface with varying features and properties. This engineering advancement creates a pressure redistribution mattress that offers the patient a clinically effective mattress with low interface pressures. Our design absorbs and redistributes patient’s weight to provide greater comfort, maximum support and proper pressure redistribution around bony prominences.The Relief-Care™Pro is covered with a Vyvex-I™ top cover and a medical grade bottom cover. Vyvex-I™ is a low shear, fluid proof nylon material which is anti-microbial, fire-retardant, stain resistant and washable. The foam core and cover meet Federal Flammability Standard 16 CFR 1633 for fire retardancy. The Relief Care™ Therapeutic Foam Mattress can be manufactured to meet California Technical Bulletin #129 and Boston Fire Code 1X-11 when specified. SCT™ technology creates an advanced pressure redistribution support surface that provides unlimited comfort zones and is effective in the treatment and prevention of pressure ulcers. 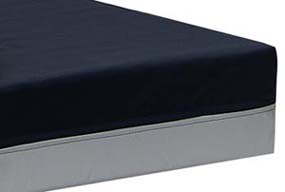 Upon request Relief-Care™ Pro therapeutic foam mattress can be customized as a bariatric mattress. Please specify patient weight when ordering. The Relief-Care™ Pro is PDAC approved and meets medicare code EO184.